Why choose solid board sheets? Solid board of SOLIDUS SOLUTIONS is a superb packaging material, offering sustainable solutions and a full range of advantages for an enormous variety of markets and products. The benefits range from increasing container fill up by 10% to reducing CO2 emissions through weight savings and lowering your container usage. We provide intelligent solid board solutions for each customer. By combining our craftsmanship & precision, we are able to meet our client’s needs. Why choose Solid Board Packaging? Solid board is a superb packaging material, offering sustainable solutions and a full range of advantages. We create outstanding and sustainable solid board packaging solutions for every customer. Find examples of our packaging cases here. SOLIDUS SOLUTIONS is the leading European sustainable fibre-based packaging provider for food & beverage, consumer goods and industrial applications. The company has a long history dating back 150 years. Find out what we've accomplished in the last hundred years. We aim to be the supplier of choice to you by providing excellent fibre-based packaging solutions. Our clients can fully rely on our service. Find out about the values we have set for our company. We find it a privilege to work with a natural and completely recyclable material and believe in sustainability as a central part in our business. Discover here our latest news. Our goal is to perform the highest quality level in our production process and we are therefore certified by some recognized international instances. Slip sheets are the most cost effective pallet replacements. The benefits range from increasing container fill up by 10% to reducing CO2 emissions through weight savings and lowering your container usage. 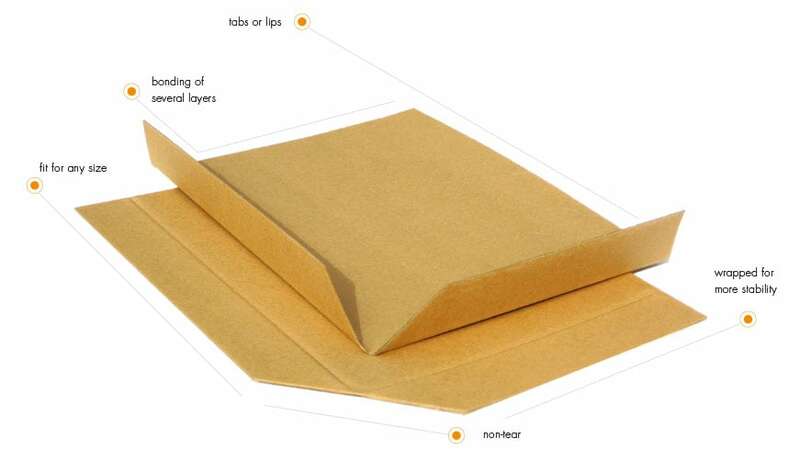 At SOLIDUS SOLUTIONS we have experience of the whole process of implementing slip sheets. Because we are manufacturing our own solid board, we have the potential to mould a slip sheet that is catered solely for your needs! Interested in our slip sheet solutions? Slip sheets help streamline major food, drinks & industrial processors exporting process. Efficient and safe logistics processes are a must for businesses. A leading British food processor informed us that their current container packing process was labour and time expensive. The container fill up process involved boxes being handled into a container by multiple members of staff. Additionally the customer wanted to know how their carbon footprint could be lowered by making the shipping process more environmentally friendly. 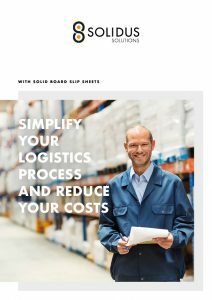 We explained not only how SOLIDUS SOLUTIONS slip sheets reduce loading and unloading times by up to 50%, they also increase container fill up by up to 10%. We were able to convince the customer and finally we implemented our product. Get in contact with any questions you have. Start the process of maximizing your container usage and minimizing your costs – today. We are looking forward to hear from you. The SOLIDUS SOLUTIONS newsletter keeps you informed on attractive offers, inspiring solutions and the latest news. You’ll be among the first to know about our new products and services to make your business even more efficient.